Regent’s Park Open Air Theatre announce casting for the opening production of their 2017 season, On The Town (19 May – 01 July). Danny Mac, Fred Haig and Jeremy Taylor take the roles of the three sailors, Gabey, Chip and Ozzie, originally played in the film version by Gene Kelly, Frank Sinatra and Jules Munshin. Siena Kelly, Lizzy Connolly and Miriam-Teak Lee take the roles of Ivy, Hildy and Claire, originally played in the film version by Vera-Ellen, Betty Garrett and Ann Miller. Also joining the cast are Maggie Steed as Madame Dilly, Naoko Mori as Lucy Schmeeler, Rodney Earl Clarke as The Workman and Mark Heenehan as Judge Pitkin. Danny Mac (Gabey) was a finalist in Strictly Come Dancing 2016 and, with dancing partner Oti Mabuse, has recently completed the Strictly Come Dancing Live arena tour. Following his training at Arts Educational Schools he played Mark ‘Dodger’ Savage in Hollyoaks, and went on to join the cast of Wicked (Victoria Apollo). Fred Haig (Chip) is a recent graduate of LAMDA. Jeremy Taylor (Ozzie) recently played Fiyero in Wicked (Victoria Apollo), and has previously appeared in We Will Rock You (Dominion), The Sound of Music (Palladium and UK tour) and Evita (UK tour). Siena Kelly (Ivy) and Miriam-Teak Lee (Claire) are both recent graduates of Arts Educational Schools and make their professional West End debuts. Lizzy Connolly (Hildy) is currently appearing in The Wild Party (The Other Palace) having previously appeared in Once In A Lifetime (Young Vic) and as Ellie Goulding in the TV series The Windsors. Maggie Steed (Madame Dilly) has enjoyed an extensive career on film, television and stage. Film and television highlights include Florence Foster Jenkins, The Imaginarium of Doctor Parnassis, The Painted Veil, Larkrise to Candleford, Jam and Jerusalem, Pie in the Sky, Victoria Wood’s As Seen On TV and the E4 series, Chewing Gum. Her stage career includes roles at the National Theatre, RSC and Royal Court, and recent credits include Richard II (Trafalgar Transformed), The Birthday Party (Manchester Royal Exchange), The School for Scandal (Bath Theatre Royal) and Trelawney of the Wells (Donmar Warehouse). Naoko Mori (Lucy Schmeeler) played the role of Kim in Miss Saigon (Theatre Royal Drury Lane) and Christmas Eve in Avenue Q (Noel Coward). Her extensive TV credits include Toshiko Sato in Torchwood,Sarah (aka Titikaka) in Absolutely Fabulous, Doctor Who, Humans, Vexed, and Yoko Ono in Lennon Naked. Her film credits include Everest, Topsy Turvy, Spiceworld, and the upcoming film Life. Rodney Earl Clarke (The Workman) has appeared in productions of The Marriage of Figaro, Cosi fan Tutte and in the title role of Don Giovanni. He has appeared as Jake in Porgy and Bess for the Berlin Philharmonic under the baton of Sir Simon Rattle, debuted the role of Crown with The Royal Danish Opera, Copenhagen, and took the title role with the Orchestra dell’Accademia Nazionale di Sante Cecilia, Rome. In the UK he has performed the Bernstein Mass with the London Symphony Orchestra under Marin Alsop and Carmen Jones at the Royal Festival Hall. Mark Heenehan (Judge Pitkin) most recently played Gyp in Jersey Boys (Piccadilly), with previous credits including Fiddler on the Roof (Grange Park Opera), Guys and Dolls (Chichester Festival Theatre) and Kiss Me Kate (Chichester Festival Theatre/Old Vic). Completing the cast are: Michelle Andrews, Myles Brown, Matthew Caputo, Edward Chitticks, Lavinia Fitzpatrick, Cristina Hoey, James Leece, Jacob Maynard, Rachel Muldoon, Melissa Nettleford, Emily Ann Potter, Mollie Melia Redgrave, Lisa Ritchie, Barnaby Thompson, Sam Salterand Brandon Lee Sears. 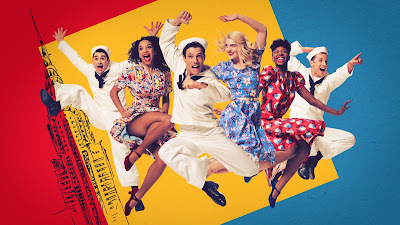 Playing 19 May to 1 July 2017, On The Town is based on a concept by Jerome Robbins with music by Leonard Bernstein and book and lyrics by Betty Comden and Adolph Green, including the hit song “New York, New York (it’s a helluva town)”. It is directed and choreographed by Drew McOnie who won the Olivier Award for Best Theatre Choreography for In the Heights before scoring a hit with his choreography for Jesus Christ Superstar in 2016, for which he is nominated in The Olivier Awards 2017. He has also choreographed Jekyll and Hyde and The Lorax (Old Vic), Bugsy Malone (Lyric Hammersmith) and Hairspray and Chicago (Curve, Leicester), as well as directing and choreographingStrictly Ballroom (West Yorkshire Playhouse) and The Wild Party (The Other Palace). On The Town is designed by Peter McKintosh, whose previous credits for Regent’s Park Open Air Theatre include Seven Brides for Seven Brothers, The Sound of Music, Hello, Dolly! and Crazy for You(Olivier Award for Best Costume Design). Musical Supervision is by Tom Deering (Jesus Christ Superstar, Open Air Theatre / wonder.land, National / In the Heights, Southwark Playhouse and King’s Cross Theatre) and, completing the Creative Team, are: Lighting Designer Howard Hudson (Romeo and Juliet, Kenneth Branagh Theatre Company / Alice’s Adventures in Wonderland, Linbury Studio/ In the Heights, Southwark Playhouse and King’s Cross Theatre); Sound Designer Nick Lidster for Autograph(Olivier Nominated for Jesus Christ Superstar, Open Air Theatre); Fiona Dunn (Associate Director); Ebony Molina (Associate Choreographer); Kevin Amos (Associate Musical Director); Barbara Houseman (Associate Director, Voice and Text) and James Orange (Casting Director). The season continues with Dickens Uncovered, celebrating the greatest storyteller of London life, Charles Dickens: Artistic Director Timothy Sheader directs A Tale of Two Cities (7 July – 8 August), a new play by Matthew Dunster adapted from the original Dickens novel and, developing their programme of work made especially for families, Caroline Byrne directs Oliver Twist created for everyone aged six and over adapted by Anya Reiss (17 July – 5 August). Completing the 2017 season, Jesus Christ Superstar returns for just 41 performances (11 August – 16 September), giving audiences one last chance to see the production in its original home. The musical, directed by Timothy Sheader, won the Evening Standard Award for Best Musical, and is currently nominated for six Olivier Awards.